Researchers have constructed a living human ear that looks and feels just like the real thing, and they made it with the help of a 3D printer. The new ear improves upon prosthetic ears made by current methods which are not only unlifelike, but often uncomfortable to wear and even painful. Better yet, at most the ear takes only a week to make. The ear wasn’t 3D printed with “living ink” – researchers still have a way to go before tissue even as simple as an ear can be fabricated de novo. For their ear, the researchers and clinicians at Cornell used a 3D printer to make a precise ear mold. Serving as medical models, the ears of two twin sisters were laser scanned and photographed with a high-definition camera to create a digitized 3D image – a process which took just 30 seconds. The image was then used to fabricate a mold with a Stratasys FDM 2000 3D printer. They then injected a gel containing collagen derived from animals into the ear mold and followed that by injecting 250 million cartilage cells. The collagen, a structural protein found normally in cells, acted as a scaffold on which the cartilage cells grew. In just fifteen minutes the ear was ready. They removed it, shaped it further with trimming, then placed it in a cell culture medium for three to five days before implanting it. The entire process from scan to implantation is about a week. Then, for the next three months the attached ear grew cartilage to replace the collagen until, eventually, only cartilage existed, just like a normal ear. The final product is an ear that looks and feels like the real thing – the best to date in appearing and functioning like a real ear, according to a Cornell University press release. The study was published in the Feb. 20 issue of PLOS ONE. Currently the gold standard for replacement ear construction involves taking cartilage from the ribs, sculpting it into an ear shape, then implant it beneath the skin where the ear should be. But this type of reconstruction has several drawbacks. Donors can be hard to come by at times, often the donated tissue does not remain healthy, and sculpting cartilage into a realistic shape can be very challenging. Ideally, the researchers say, the replacement ears would be implanted in children around 5- or 6-years old, when their ears have grown to about 80 percent of their adult size. Dr. Jason Spector, director of the Laboratory for Bioregenerative Medicine and Surgery at Weill Cornell Medical College and second lead author of the study said they’re not sure that an implanted ear would grow once attached, but he thinks they would. Dr. Spector – who was named one of “America’s Best Doctors” in 2011 by US News and appeared on the ABC documentary “NY Med,” also featuring renowned – and controversial – Dr. Mehmet Oz – said that if all the safety and efficacy tests go well in the future, the first attempt to implant the ear on a patient could take place in three years. Microtia is a congenital deformity in which the external ear does not develop fully or is absent entirely. Its cause is unclear, but it is thought to be linked to acne medicine taken by the mother during pregnancy. Microtia is pretty rare, occurring in only 1 to 4 births out of 10,000, but for those few suffering from it the benefits of replacing their deformed ear with a natural-looking one are enormous. Not only do they look normal again but a properly shaped outer ear allows sounds to correctly enter the inner ear which is typically not defective in these individuals. People who have lost an ear for other reasons such as an accident or cancer could also benefit from the new manufacturing method. 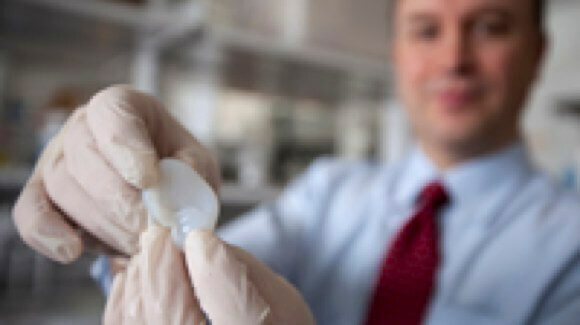 3D printing continues to impact medicine in new and exciting ways. Dentists are using 3D printers to create replacement jaws and custom crowns “while you wait,” and doctors are planning operations with CT-scan precise models of bones that are a fraction of the cost to make than conventional models. We haven’t quite reached the point where we can feed “living ink” into a printer and fabricate working organs that possess all the complexity of real organs, but that day will certainly come. For the moment, we’ll have to be content with the comparatively incremental advances in cost, convenience and quality 3D printers will continue to bring medicine. No doubt the patients who benefit from the will be.